Ambulon is a bizarre sight indeed, claimed by many to be a hive in in its own right. The entire city is mounted on the back of a machine that slowly walks across the unstable rocky regions in the center of Scintilla's main continent. The machine is extremely old, and was almost certainly already on Scintilla when the Imperium conquered the Calixis sector. It is probably a pre-Imperial artifact, constructed by a civilisation that fell before the foundation of the Imperium, though some claim it is a relic of pre-Heresy terraforming technologies. Certainly the skeletal ruins of moving constructs similar to Ambulon dot the central steppes. Ambulon's unusual form affects every aspect of life in the city, from the industries that employ it's middle class citizens to the city's customs and folklore. Ambuon is navigated vua a huge and very complicated control center, powered by arcane engines of incredibly occult design, in the area corresponding to its head. 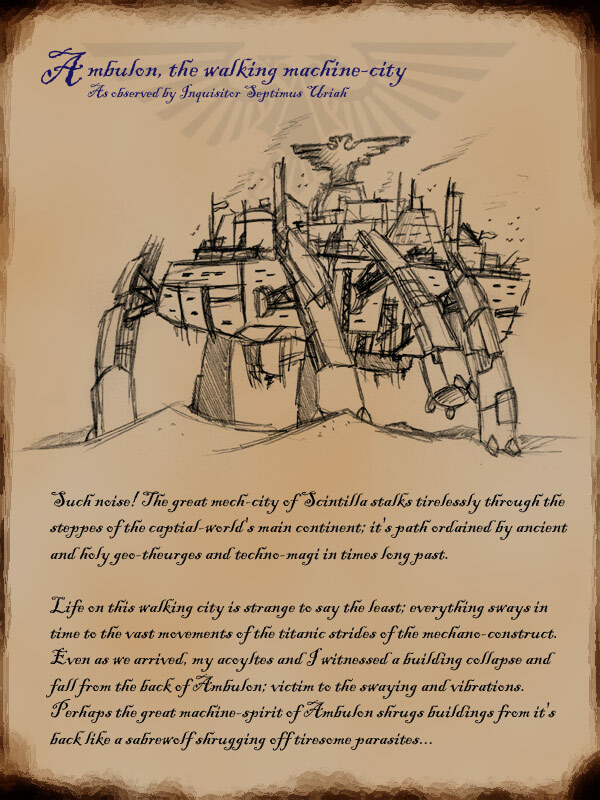 The Guild Peripatetica, highly superstitious engineseers who keep the secrets of how to control the citadel-mechanicus, are constantly scrambling about the intricate controls making tiny adjustments to keep the edifice moving. Many takes of hive folklore dwell on the terrible consequences should Ambulon ever stop, varying from the city simply collapsing to the machines becoming self-aware and devouring the humans clinging to its back. The noble houses quarrel constantly over what orders to give the guild, but they are also well aware that they should not bully or otherwise cross the Guild Peripatetica lest the engineseers point them towards a crevasse or other dangerous obstacle and hold the citadel to ransom. The path that the machine takes is crucial to harvesting the deposits of oil, natural gas, and precious stones that form Ambulon's contribution to Scintilla's tithe, and everyone has an opinion about where it should go next. Ambulon stalks the wastelands, mining and harvesting the planet's natural resources, supplying the manufactories of Hive Sibbellus and Gunmetal City. Neither could function without Ambulon's resources. Ambulon tours the steppe wastes once every twenty-eight months, slowing to minute speeds in order to dock with Sibellus and Gunmetal City for a few days to offload ore and mineral resources. Between these celebrated ceremonial times of docking, Ambulon supplies Sibellus and Gunmetal City by way of regular land trains: ore-cargo crawler pods many kilometers long. Ambulon's constant movement means that even the most solid buildings are in danger of being shaken off the city's structure. This in turn means that the city's wealthiest and most important districts are located in places where they are least likely to be destroyed, especially along the city-machines's Spine. The Spine's buildings are rarely as big as on hive spires, since space is at such a premium on Ambulon's carapace, nor are they as tall, as they have to endure the constant swaying of the city-machine's slow, rolling gait. The style of the Spine sees elegance and even minimalism preferred to the grotesquely grandiose ornamentation common in the great hives. The nobles of Hive Sibellus, in particular, consider Ambulon to be a cultural backwater, whose nobles neglect the proper pursuits of beautifying their city and venerating their dead. Ambulon's equivalent of middle hivers are the hundreds of thousands of workers who inhabit tenement blocks piled up on the vast, shield shaped back of the city-machine. These tenements are plagued by cityquakes caused by the city's movements, and are all shored up and extensively repaired after past collapses. Few streets run between Ambulon's buildings since there is not enough space for them, so the middle classes tramp to work across the roofs of the tenements, or even through each others' homes. Almost all middle classers are engaged in harvesting or refining the raw materials that Ambulon gathers from the igneous wastes. The "head" of the city is equipped with immense drills that can be lowered into the rock and when the city strikes oil, thousands of flexible pipelines are lowered from the edge of the city to pipe up as much of the oil as possible as the city-machine passes by. Working on these pipelines, which are controlled by webs of chains like the strings of vast puppets, is very dangerous and requires a hardy breed of men and women with no fear of heights. Ambulon's many refineries process this oil into promethium fuel, some of which is piped back into the city-machine, while most forms the majority of the city's tithe contribution, to be delivered to Hive Sibellus and Gunmetal City. Other citizens sift through the rock thrown up by the drilling to pick out precious stones, which are then worked into industrial components or cut for jewelry in workshops inhabited by generations of gem cutters (considered a hereditary occupation on Ambulon). Ambulon's lack of space means that every citizen must justify his presence there and unemployment is illegal. Each household in the middle city is tied to a particular refinery, workshop, or other industry and its members may not work anywhere else. It is vitally important for every middle citizen to be properly recorded in the Rolls of Justification which each place of industry maintains, because if they cannot prove to the authorities of the Spine that they are permitted to fulfill the role in which they work, they are banished to the underbelly. Ambulon's "underhive" clings precariously to the belly of the city-machine. It is known by a variety of colourful names such as the Underbelly, the Guts, the Vitals, or the Hivegroin. Clusters of hovels blister down from the city-machine like warts, connected by makeshift catwalks and rope bridges. Many thousands of people live only a footstep away from plummeting to their deaths towards the rocky ground that constantly grinds by hundreds of meters below. Underbelly settlements are often scraped off by ridges or peaks that the city -machine walks over, or are simply shaken off by the city's movement. Life is short and very difficult here, and the Gutscum live off the detritus and waste thrown off the edge of the city-machine's back. One prominent feature of the Underbelly is the cages hung from the edge of the city above containing prisoners condemned to the much-feared punishment of "dangling". The prisoners are locked in a cage attached to a long chain, which is then flung off the edge of the city-machine and left to dangle, swaying with the city's movement, until the prisoner starves and the cage is hauled back up. Hundreds of dangled prisoners hang from the city at any one time, and the Gutscum sometimes use them as target practice or, on very rare occasions, "rescue" them to induct them into Underbelly gangs, enslave them or pit them against one another in bloody gladiatorial fights. Ambulon folklore maintains that some dangled prisoners have survived for months dangling below the city thanks to divine intervention from the Emperor, and were released when the cage was brought back up again to live saintly lives. In practical terms, however, dangling is a cruel, drawn-out death sentence.